Vanessa Fernandes of Portugal has just won the 2007 Lisbon BG Triathlon World Cup, in front of an estimated 40,000 ecstatic Portuguese fans and thousands more tuning into the live national television show. After exiting the water an unusual 36 seconds back from the leaders, the 2006 world cup series champion, with determination on her face, was able to pull herself up to the lead group and run to gold in a time of 2:04:45. In second place was Michelle Dillon of Great Britain, 1 minute and 21 seconds back. And rounding out the top three was Christiane Pilz of Germany a further 24 seconds behind. With her win, the 21-year old Fernandes moves to the front of the 2007 BG Triathlon World Cup rankings with 149 points. 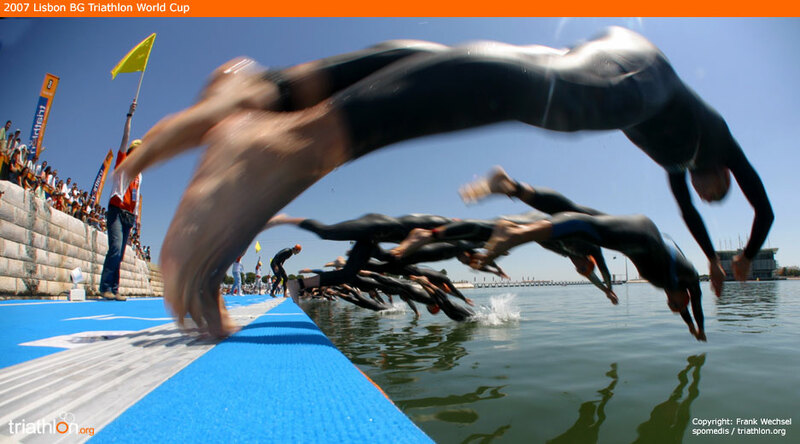 Seventy-two women dived into the Atlantic Ocean to start the 2007 Lisbon BG Triathlon World Cup under clear skies. From the starting horn it was Jill Savege of Canada, Sarah Haskins of the United States, Julie Swallow of Great Britain, Annabel Luxford of Australia, who would later have to withdraw due to mechanical problems on the bike, and Pilz who jumped to an early lead with Fernandes, Dillon and a number of other top contenders over 30 seconds down. I had to push hard today for the first pack, said the European champion. Sometimes you are in the front and sometimes you are not. Sometimes you have to put your head down and work hard. Onto the 4-lap, 10 kilometre run course, Fernandes immediately pulled away and never looked back with the fastest run split of the day, 34:21, to claim her 15th world cup title. To the cheers of thousands of spectators in the enclosed stadium finish, Fernandes was embraced by her father, who has only ever seen his daughter race once before, as she crossed the line. Dillon, who managed to come back from an 84 second deficit after the swim, was able to run herself into 2nd place with Pilz coming through in 3rd. This is fantastic, replied Pilz, on the chanting crowd. It feels as though you are pushed.Like running on a cloud. The crowds cheered for everyone out there. Not just the Portuguese. Sarah Haskins of the United States and Flora Duffy of Bermuda rounded out the top five with career-best performances for both these young athletes. Vanessa Fernndes de Portugal ha ganado la Copa del Mundo BG 2007 en Lisboa, delante de aproximadamente 40.000 animados seguidores portugueses y miles ms que desde casa sintonizaron en directo la televisin nacional. Despus de la inusual salida del agua 36 segundos por detrs de los lderes, la campeona del 2006 de las series de la Copa Mundial, Fernndes, con la determinacin en su cara, fue capaz de entrar en el grupo lder y correr hacia el oro en un tiempo de 2:04:45. El segundo lugar fue para Michelle Dillon de Gran Bretaa, 1 minuto y 21 segundos ms tarde. Y el Podium lo cerr Christiane Pilz de Alemania 24 segundos ms tarde. Ver el exclusivo video de la carrera ahora. Con su victoria, Fernndes de 21 aos de edad se coloca al frente de la clasificacin de la Copa del Mundo BG de Triatln con 149 puntos. Sarah Haskins de los Estados Unidos y Flora Duffy de Bermudas redondearon las cinco primeras posiciones en la mejor actuacin de estas jvenes atletas. Ver el exclusive video de la carrera ahora. Pulse aqu para ver la galera oficial de fotos.